I have received a lot of E-mails over the weekend about a paper released by the CEPR Policy Portal VOX (June 20, 2015) – Can central banks avoid sovereign debt crises? – which purports to provide “new evidence” to support the conclusion that “the ability of the central bank to avert a debt self-fulfilling debt crisis is limited”. It is another one of those mainstream attempts to brush away reality and draw logical conclusions from a flawed analytical framework. When one digs a bit the conclusion withers on the vine of a stylised economic model that leaves out significant features of the monetary system – such as for starters, a currency-issuing government can never go broke in terms of the liabilities its issues in its own currency. All the smoke and mirrors of stylised New Keynesian mathematical models cannot render that reality false.In other words, the paper and the lineage of papers it draws upon should be disregarded by anyone who desires to understand how the monetary system operates and the capacity and opportunities that the currency-issuing government (including its central bank) has within that system. The motivation for the VOX article is the observation that “the sovereign debt crisis that has impacted European periphery countries since 2010” has arisen because of “self-fulfilling sentiments”. What does the jargon mean? Self-fulfilling expectations simply means if people believe something will happen and act accordingly then their actions drive the belief to realisation. If market participants believe that sovereign default of a country is more likely, they demand higher spreads, which over time raises the debt level and thus makes eventual default more likely. Applied to the Eurozone situation since the onset of the crisis, it is difficult to disagree with the contention. Bond spreads (between the ailing nations and the German bund) have variously widened over this period as the bond markets feared an exit was coming or some default was imminent. But as the authors note, the same dynamics have not been observed outside of the Eurozone and they cite sources that attribute this “to the fact that the highly indebted non-Eurozone countries have their own currency”. There is no rocket-science involved there. They also recognise that the Eurozone spreads declined rapidly “since mid-2012” when there was “a change in ECB policy towards explicit backing of periphery government debt”. They should have actually realised that the ECB saved the Eurozone from collapsing much earlier than mid-2012. When the Greek government effectively lost access to the private bond markets in early 2010, it was almost certain that they would have to default on their maturing liabilities and exit the Eurozone. The fears were that the Greece exit would be the first domino of several to fall. Further, given the exposure of the big French and German private banks to Greek government debt and the linkages between these banks and other banks throughout the European financial system, it was also considered likely that a default would trigger a general financial collapse. There were mixed views on this among the political elites in Europe. While the doomsday claims about the consequences of a Greek exit were nonsense (and remain so today) and designed to advance the neo-liberal agenda of the elites, there is no doubt that the integrity of the Eurozone was under threat in early 2010 as the Greek government approached insolvency. Moreover, the bailout programs that we being discussed were never going to be sufficient to ensure Greece or any other nation remained solvent. Given the structure of the monetary system, it was obvious that a major ‘fiscal-like’ intervention was going to be required to keep the nations solvent in the face of growing private bond market uncertainty and withdrawal. But while the ratings agencies, whose behaviour leading up the GFC had been exposed as incompetent and corrupt by US Congressional hearings, were circling with downgrades and issuing all manner of spurious briefings about likely insolvency to investors, it became obvious in May 2010 that the ECB would use its ‘currency issuing’ capacity to ensure no Member State became insolvent. Effectively, a massive ‘fiscal operation’ was introduced, seemingly in violation of the Treaty rules. But, without any doubt, it saved the Eurozone – for the time being. … conduct outright interventions in the euro area public and private debt securities markets. See – Decision of the European Central Bank of 14 May 2010 establishing a securities markets programme. What did that decision mean. It was central bank-speak for buying government bonds in the so-called secondary bond market in exchange for euros, that they created out of ‘thin air’. Government bonds are issued to selective tender in the primary bond market and then traded freely among speculators and others in the secondary bond market. The SMP also permitted the ECB to buy private debt in both primary and secondary markets. To understand this more fully, the decision meant that private bond investors (including private banks) could off-load distressed state debt onto the ECB. 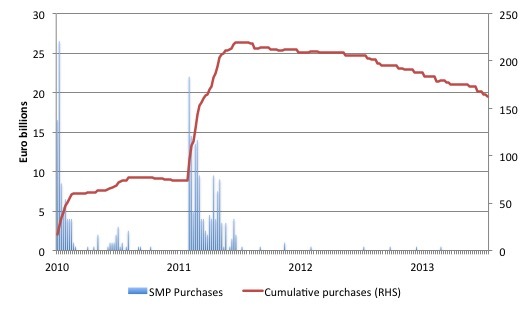 The following graph shows the history of the SMP program, which was formally replaced on September 6, 2012 when the ECB introduced the ‘Outright Monetary Transactions (OMT)’ program. The bars show the weekly debt purchases while the line shows the cumulative asset holdings associated with the program (in billion of euros). Clearly the ECB accelerated their purchases at times when the difference between the yields on some Member State government bonds against the benchmark bond, the German bund (the ‘spreads’) were widening significantly. The initial spike from May 2011 was associated with the escalation in spreads on bonds issued by Greece, Ireland, Portugal and Spain. The second, larger acquisitions began in August 2011 and were mostly associated with the sharp rise in the spread on Italian government bonds, which went from 1.5 percentage points in April 2011 to a peak of 5.2 percentage points in November 2011. The large-scale ECB buying stabilised the spreads by the end of 2011. Given the size and importance of the Italian economy to Europe, the ECB was clearly not going to allow the Italian spreads to rise as quickly or as far as the Greek spreads had risen. Of-course, the later bailouts effectively allowed the Greek government to ignore the bond markets, which meant that the size of the spreads were moot anyway. After the SMP was launched, a number of ECB’s official members gave speeches claiming that the program was just part of the normal weekly central bank liquidity management operations which was spin in the extreme. Of course, they were trying to disabuse any notion that the ECB was funding government deficits. This was to quell criticisms, from the likes of the Bundesbank and others, that the program contravened Article 123 of the Treaty of the European Union. Whether it breached Article 123 is moot but largely irrelevant. The SMP reality was that the ECB was bailing out governments by buying their debt and eliminating the risk of insolvency. The SMP demonstrated that the ECB was caught in a bind. It repeatedly claimed that it was not responsible for resolving the crisis but, at the same time, it realised that as the currency-issuer, it was the only EMU institution that had the capacity to provide resolution. The SMP saved the Eurozone from breakup. So unlike the VOX author’s contention it was not the 2012 “whatever it takes” announcement by ECB boss Mario Draghi that saved the day. That was just a more explicit recognition of what they had been doing since May 2010 – using its currency issuing capacity to ensure no government became insolvent. While it is certainly possible for a central bank to adopt a policy that avoids a self-fulfilling default equilibrium, such a policy needs to be credible. If it is credible, it would not even be necessary to actually implement the policy. This is now mainstream economist-speak. Credibility has nothing to do with the capacity of the central bank to eliminate the risk of government insolvency. Whether the private bond markets believe that the central bank has that capacity is irrelevant. They soon see it in the trading realities of the secondary bond markets when they keep getting outbid for bonds by the central bank that always has a superior purchasing capacity. They see it when yields that they would like to rise (to reflect risk or greed) stay low because the central bank demonstrates its unflinching commitment to control rates – as it only can in a modern monetary system. So belief soon adjusts to reality. Remember that in a fiat currency system with no convertibility (into gold etc) and no fixed exchange rate arrangements in place, it is the currency issuer that is in ‘charge’ not the bond market dealers. The latter are supplicants at best, beggars who want their dose of corporate welfare. They have no power against the currency issuer. Please read my blog – Who is in charge? – for more discussion on this point. A central bank could always surprise debt holders by creating inflation or could buy large amounts of government debt by printing money. But how high should inflation be? And how easy is to create surprise inflation when prices are rigid? If the required inflation is too high, investors will not believe in such a commitment and the ‘bad’ equilibrium could not be avoided. In the end, this is a quantitative question that requires a reasonably realistic model. Which explains why inflation is so ‘high’ (not) in the US, Japan, etc as the balance sheets of the central banks have grown in multiples since the crisis. View the latest range of products at Woolworths Catalogue. Once again, the capacity of the central bank to eliminate the possibility of a “bad equilibrium” (which means a government not being able to borrow from the private markets sufficient funds to cover its deficit), is not dependent in any way on whether private bond investers believe anything. It is also not a “a quantitative question that requires a reasonably realistic model” at all. The most realistic model is known in fine detail. It is the real world of currency issuers. In that world, if a central bank acts according to its capacity the corresponding government or in the Eurozone, governments – can never go broke. No analytical model – New Keynesian – or otherwise is required to establish that fact. Of course, that reality escapes the authors who had been reading a paper – Slow Moving Debt Crises – by two US-located academics. The paper is an example of GIGO – garbage in, garbage out. It aims to explore “What circumstances or policies leave sovereign borrowers at the mercy of self-fulfilling increases in interest rates”. I wouldn’t bother reading (or attempting to read) it if you like to spend your time productively. Unfortunately, as an academic I have to waste time reading things like this – it is part of the job. Experience means I minimise the time wasted though which was not the case when I started out – a lost ‘youth’. Their New Keynesian ‘model’ invokes all sorts of assumptions to make the mathematics tractable and to establish their prior ideological position that “slow moving crises” can “be avoided … whenever debt is low enough”. Maybe they should stop squiggling for a while and wonder about Japan! In other words, the real world is too difficult for the type of mathematical tools and framework they are trapped within. They squiggle away for page after page defining things such as “maximal debt capacity” which really just result in some expression that says the government will default when some condition is met. They never once ask the question: What are the capacities of a sovereign, currency-issuing government? If they did, and could answer the question properly, they would realise their efforts were a waste of time. This is worse than digging holes and then filling them in again by way of productive work effort. Yes, in the land of never never which bears no relation to the real world that we all live in and in which currency issuing governments can never go broke irrespective of the level of debt they are carrying or the size of their deficits. But the VOX authors use this ‘model’ as their starting point, which means their end point becomes irrelevant too. Their New Keynesian model ends up with very high inflation as the central bank goes on a bond buying spree. Once again, they should look around and attempt to understand recent history. They should also understand that building reserves in the banking system is not an inflationary act. If it was, Japan would be following Zimbabwe down the drain – and would have done so before Zimbabwe led the way. Reality has a way of enforcing us to ask questions about the type of frameworks and the predictions forthcoming from those frameworks. There is nothing worthy in the New Keynesian frameworks. They failed to foresee the crisis and more extreme versions led to the belief that the business cycle was dead! The ECB would be powerless if there were a broad sovereign debt crisis across the Eurozone, in the same way that the Fed or Bank of Japan would be powerless to credibly avoid a self-fulfilling debt crisis in their countries. The ECB could buy all the government debt issued and could then announce that it would credit the various treasury accounts with funds to match the deficits at will. The inflation risk would result not from the ECB monetary operation but from the public spending growth if it exceeded the real capacity of the economy to produce goods and services in response. But if these nations were already at full employment – then there would be no reason to expand the deficits anyway and the existing fiscal parameters would be deemed appropriate. That is, that spending growth would, in conjunction with the non-government spending growth be sufficient to productively deploy all the available productive resources. What the hell is “surprise inflation”??? If Central Banks can always create inflation, maybe the authors should do Japan a favor and let the BOJ folks know what the secret is since theyve been trying for at least a decade without success. Is the exposure of German and French banks to a Greek default really that large? After all, Greece has only slightly more than 2% of the total EU population. If the ECB were to bail out the Greek government, that would be the equivalent of the Australian central bank bailing out the state of South Australia. The other states would probably object because they would see it as rewarding profligacy. The real obstacle to a bail-out of Greece by the ECB is political, not economic. Bear in mind that the central banks of the US, Canada or Australia never bail out states or provinces. Article 123 states that the ECB is prohibited from buying member states’ “debt instruments”. It is buying Greek government bonds, so evidently government bonds are not debt instruments. Aha! So what is all that national debt our governments are telling us is such a millstone? I suspect there is a hidden agenda here. All this Greek shilly-shallying is just a wool-pulling exercise so all us chickens in here think the politicians are saving us, when meanwhile the super-rich are cashing in on ridiculously high coupon rates for some EU member states’ bonds. In fact, as the EU is effectively the currency-issuer, member states should not be able to go bust or default if the ECB is doing its job, just the same as for UK, USA, Australia or anywhere else. I have also seen a comment from Warren Mosler that the member states’ governments’ procurement is paid by the ECB so, if this is correct, effectively the EZ is behaving just like a sovereign state. It creates the euros to pay for the states’ spending. It cannot go bust, nor can its member states. But them I’m just one of them chickens. What do I know? James, you posted your response a few minutes before mine. What you say is correct, but remember the Orange Conty default in 1994 when the county (not even a whole state) filed for bankruptcy protection. Was it a disaster? Orange county hasn’t fallen into a black hole, it’s still there. It still paid its employees, and it still paid its suppliers. Only the rich bond-holders would have lost out. Oh dear what a shame!. Keeping the nominal rate under the natural rate would cause deflation? Isn’t this Mosler-esque (barring the ‘natural rate’ nonsense)? So I do wonder why the Greek government hasn’t tendered to the commercial banks in Greece for an unlimited overdraft, which the commercial banks could, if required, take to the Bank of Greece and discount under the ELA arrangements. *Nothing* in Article 123 prevents that. All you are doing is paying corporate welfare to a commercial bank for the facility – welfare that should be reduced with a decent competitive tender – or for that matter via a public commercial bank (see para 2 above). At that point the private bank could create whatever Euros are required to pay off the Troika plus a few extra which the government immediately uses to purchase capital in the bank to ensure the capital ratios hit the ECB mark. In Australia state government can borrow at a ‘subsidised rate’? Correct me if wrong Bill? “There is nothing worthy in the New Keynesian frameworks. They failed to foresee the crisis, and more extreme versions led to the belief that the business cycle was dead”. Yes ,and yet to my understanding they now teach graduate students in business schools that they ” won’t have to worry about business cycles because it’s a solved problem”. Bob: FYI, There is a case winding it’s way through the courts in Canada which attempts to restore the original BOC mandate which provided money from the central bank to provinces and municipalities at zero interest so they were able to invest in projects in support of the common good. Somehow it stopped doing that in the early 1970’s with no changes made to the original central bank act. Since the provinces are responsible for health, education etc they are becoming increasingly paralyzed as neo liberal thinking dominates fiscal policy at the federal level. Odd, the VoxEu website offers no way to directly comment on their essays. I wonder why. They have a Twitter account, @VoxEU. Is there a piece out there that you can point me to that helps me understand the following gaps in the process. Step 4: Introduced a fiscal policy like above to attain ful employment – The deficit would be equal to whatever full employment is. Step 5: Instead of issuing debt (bonds) to get that deficit they bought most or all of it themselves. Or just paid an interest rate on the reserves in the overnight interbank markets to meet their target interest rate. Step 6: How do they pay off the debt in reality in step 5 ? a) If they bought the debt themselves does this mean they could write it off anytime they like as in reality they only owe money to themselves ? b) Who do they pay the reserve interest rate too if they don’t issue bonds is it the commercial banks ? If so is this really debt ? Is this just not currency flows between current (reserve accounts) at the commercial banks and the central bank. I.e their accounts would just go up ? This is a huge gap for me. I would like to understand it better how would this process work in reality. I can picture a link between bonds and maintaining a target interest rate but not between bonds and issuing debt? Bonds financing debt makes no sense. Surely the interest rate target in an MMT world would be zero percent and to spend you would just debit and credit private banks account held at the Central Bank [exchange settlement]. Derek, I will give it shot, although others are much more versed than I. In the simplest of terms, the debtor, the central bank (the Sovereign Government), simply reverses the entry that created the debt in the first place. A financial institution exchanged bank reserves (cumulative customer cash deposits) in a local currency unit for local currency unit, represented by an interest bearing government bond (T-bill etc). When that bond matures, the reverse happens. See Daily Treasury Statement of the US Treasury and you will see that over $49 Trillion has been retired this fiscal year to date. No different than you debiting your savings account for $1,000 to purchase a US savings bond, face value of $1,000. Afterwards, you are no richer nor poorer in monetary terms, and when the bond matures, you surrender it and your bank account is credited for $1,000, plus any coupon interest and that’s it. The government, one that has currency sovereignty, has no intrinsic reason to ever raise funds by issuing bonds or taxing, prior to spending. Again, a nation with currency sovereignty is not analogous to a private sector household or firm. These links may prove helpful. You don’t. Because it is an accounting liability to balance the ‘rainy day’ funds people are holding in the Scottish Currency. It’s isn’t ‘debt’ in the sense of being a real burden or an obligation to anyone. That’s the key MMT point. To ‘pay off’ the debt you have to confiscate everybody’s rainy day funds and every note and coin in every wallet and purse in the land. So you don’t do that. Instead you learn that not every liability is a burdensome debt in the same way that you learn the planets go around the sun and not the other way around (even thought that is how it appears at first glance). And you don’t pay interest on reserves either generally – because: why pay welfare to banks? Generally there is over lending in an economy so no need to make the loans cheaper by subsidising them. Just reduce taxes or increase government spending instead. It goes to the commercial banks who hold the reserve accounts. It’s a welfare subsidy to the commercial banks. At best it reduces the cost of loans, at worst it goes straight into the pockets of bankers and shareholders. Thanks Neil, Alan and Daniel. So would you just say okay an independent Scotland would not issue bonds at all. After all governments spend first and the bond sales always come later in the interbank market to either drain off the reserves or increase the reserves so that the central bank can meet it’s over night interest rate. Would you say then that the Bank of Alba would just keep interest rates at zero and create a banking sector whereby the central bank replaces the role of the commercial banks as the currency issuer ? All the commercial banks would be is a mirage that would create loans ( so they can make a profit) under very strict regulation. These loans would only be for common purpose ? Also the Bank of Alba would pay interest on the overnight reserves ( this would be how they pay off their so called debt to the voter) By moving currency between the reserve accounts and the saving accounts. With a very regulated process in place to make sure that commercial banks could only use this payment to reduce the cost of loans ? As a starting point to show the difference between propaganda and reality. To show what a disaster it would have been if we had joined the Euro and why having our own central bank matters and our only option. The process and questions I asked in my previous post is to put together the solution in simple steps. To present at The Common Weal events right across Scotland. I go to them in my area in the South side of Glasgow and have made quite a few contacts in the process. At the moment their whole focus is on local democracy to take power away from the centre. Models they use are based upon theories introduced by Gar Alperovitz as they are scared of the international markets. I wish JD Alt could produce diagrams to show how the Bank of Alba can pay off the so called debt in the scenario above if we just paid interest on reserves. With a new regulated commercial banking sector and how it would work in reality. People who are not up to speed will always ask – Well how do we pay for it then ? I need a solid and easy to follow process to show them. Also we need another diagram to show how imports and exports work in reality at the bank of Alba. Which show why exports are a cost and imports a benifit. Which also shows clearly the operations between current accounts and saving accounts within the bank of Alba and the options other countries have once they have sold us something. Once I have these 2 things I think I’m ready to start spreading the news around Scotland. If JD Alt could put this all together in 4 simple flows like the first 2 I’m convinced we are ready to present. I’m also going to include recent Bank of England reports to support my presentation. Japan our poster boy keeps destroying the myths. So the final presentation would look something like this. Bank of England reports – to support the reality. I would just mention these they can check them out for themselves. Stephanie Keltons video – to show why joining the Euro would have been a disaster for Scotland. Bill’s Japan blog to show the truth and how we really protect ourselves from the international markets. I look forward to seeing your presentation if you do one in Edinburgh. The currency independence answer should be a core part if independence thinking,strategy. The SNP made a right hash of it at the referendum, but then they were just looking for devo max at the time. I just joined the Scottish Green Party (SGP) with the express aim of pushing them towards MMT framing of economics. Basically I’m fed up of the Greens (and progressives as a whole) losing the argument before they’ve even begun by promising their policies are ‘fiscally responsible’ (read ‘stupid’). Stupid because it only serves to validate the ‘household budget’ framing of their political enemies. Anyway, I just wanted to say I’ve only been to 2 SGP meetings (in Fife), but at both people mentioned ‘The Common Weal’, which I must admit I had never heard of before. Must google them, but it sounds like both organisations have a lot in common with each other. Just to let you know there is grass roots awareness of MMT in the Scottish and English Greens, which I find heartening. Now all we have to do is get noticed higher up in the party, where it really matters! As Bill said the other week, regarding Natalie Bennett’s ‘brain fade’ interview, the Greens are going to look stupid and, more importantly, not achieve their policy goals unless they adopt the hugely radical (and correct!) framing of MMT. By the way, to show MMT is credible, I think its worth telling people of Stephanie Kelton’s recent appointment to the US Senate Budget Committee and that noted economist James Galbraith (son of the famous JK) endorses it. On the Bank of Alba paying off the national debt. That’s not a good idea (as Neil explained above). Exchange rates are driven as much by exporting nations wanting to support jobs at home (which would tend to drive up the UK £ for example – they do this by buying the importing nations currency) as by the fact that there is a perpetual trade deficit (which would tend to drive down the UK £ for example). Good luck with spreading the word around Scotland. Much of the content is lifted from Stephanie, Bill etc., but is a very good presentation. the details are all very interesting.The substance is we have evolved fiat currency. Money by government decree.The rest is smoke and mirrors.It comes down to power. a form of monetary stimulus . Yes I Know, but if I’m going to stand there and say the bank of Alba will buy it’s own debt up or just pay interest on it’s reserves. I Need to show what happens after that and how that liability is destroyed in reality. I’ve seen that video it is very good. Why would the Bank of Alba be buying up debt or paying interest on reserves? It wouldn’t need to do either of those things. Economic policy driven by MMT would mean the Scottish government wouldn’t be issuing bonds, so there’d be no debt to buy up, and interest rate adjustment would not be used to try to boost/dampen the economy, so there’d be no need to offer interest on reserves to hit that target. What liability needs to be destroyed? Sorry meant to say also in that operation no liability is destroyed. That only happens when tax, fines etc. get paid to the government and the money (government liability) and tax (your liability) are mutually destroyed. Again quoting Warren, money is a tax credit.